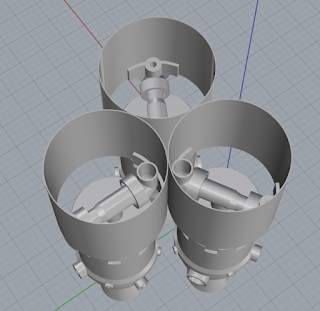 Looking at various possible layouts for the bottom of the Third Stage. The Grey is the 3D printed motor. The Red is the peroxide coming back up the cooling passages... (The gold and red connect at the right end of this drawing. The Green is the Catalyst pack that turns the oxidizer from liquid to Steam and hot Oxygen. The Yellow in the band around the middle and in (two shown) the four fuel injectors that inject fuel just below the cat pack. 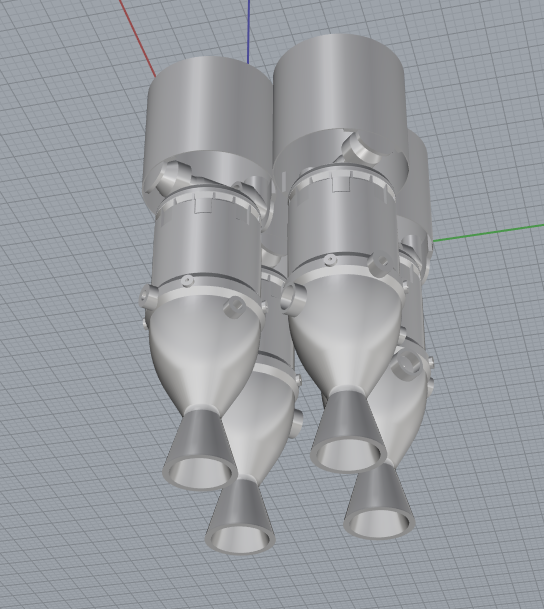 We need to build a vehicle light enough with a good enough performance to get to orbit. We need to make sure we can make it go in the desired direction. We need to involve the regulatory agency so we can do this legally. Spread sheet and simple performance model says 4" diameter 16" long OTRAG tube rocket can get to orbit. I have tested representative tanks with the required mass ratio. I have one full size sample, I still have to test that. 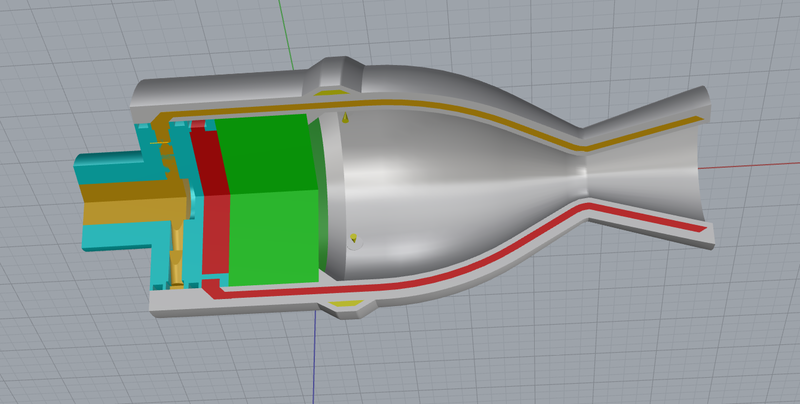 Finish Detail design of Full Airframe. Designed Motor and had it 3D printed in Aluminum. Design and test high expansion ration version. 3)Good high quality vehicle simulation for performance optimization and HIL testing. Selected Simulator (JBS Sim) and contracted to have a good initial model built. Pick an archetecture (I think 75% confidence) we will use one of the tiny pixhawk clones for avionics. Find a light weight GPS that will work without co-com limits at high acceleration. We have flown Piksi on a HPR twice continue to work on that aspect. Conceptual GSE concept that minimizes weight on the airframe. Uses single "Tube" to fill and pressurize remotely. Design airframe QD and ground GSE. Will do inital testing at FAR up to 50Kft. Then will do suborbital flights offshore. First stage constrained by physics from hitting anything. 2,3,4th stages made of low temperature tolerant composites, so incapable of high speed flight in the atmosphere. Start discussion with FAA for orbital licensing requirements. Spent the first half of the day cleaning the shop.... I have way too much stuff. Notice that the only video we have seen is of it flying somewhat low over water. This means in the mind of the designer its not safe over anything hard. There is pitch and yaw control, but no roll control other than weight shift. To me this means that the output from the two jet engines must be really closely matched. Loose either engine to something as simple as an air bubble in a fuel line and your spinning wildly out of control. 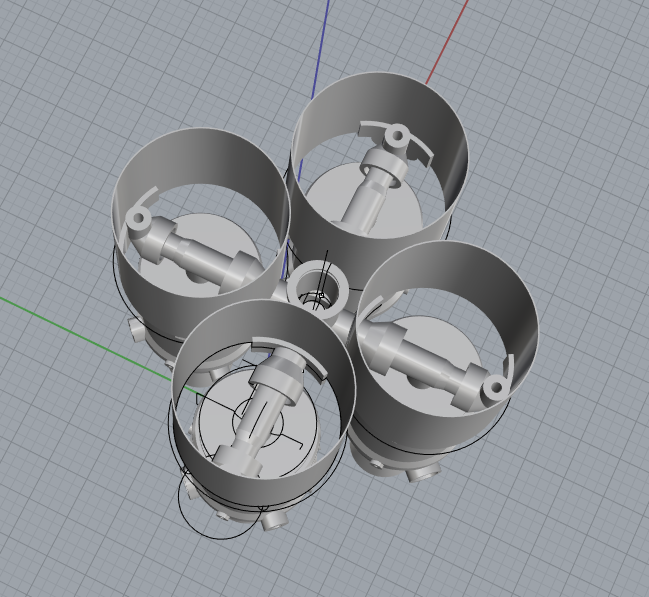 So how would you build a safe useful jet pack? Minor expected faults won't kill you. Single engine, sensor or actuator failures wont kill you. Able to fly at whatever altitude fuel will allow over any surface. Engine out failure recovery from any altitude. Safe escape from and single engine,sensor battery or actuator failure. This implies to me multiple engines with some kind of thrust vector control. You need enough control authority to maintain stability with one engine out. You need enough control authority to maintain stability with one actuator or motor in hard over failure. 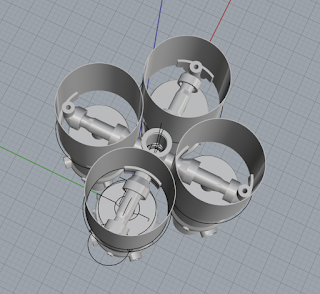 So I see something like 3, 4, or 5 smaller motors per side. If you need thrust vectoring then a flap that you can deploy into the exhaust stream that deflects it in the direction of the semi circle away from the pilot. I just don't see how the Jetpackaviation jet pack we have all recently seen could be made "safe" for flight over hard surfaces. From their images JB-8 was more of a flying sled. Its real clear that the JB-8 used two TT-100 247lb thrust jets, the same as the sonix jet uses. These are about 50K each. In looking at the middle of their three videos the "Gopro" one that they are using standard box stock RC turbine ECU displays for the engines mounted on the stick grips, these displays are on the tether flight video, but not the NY harbor one... or the promotional jet pack pictures. On the tether flight video one can clearly see a large LIPO battery pack connected to the engine ECU under the cover. Edited to add info on what motors they are using.